Day Two's Cheltenham Festival highlight is the Champion Chase, the ultimate test of jumping with speed and accuracy. It is always one of the most thrilling spectacles of the whole week and, this year, we have the mighty Douvan to look forward to. From a betting perspective, we need ask whether he Douvan can be beaten and, if not, how else we might go about snaffling some value (assuming you don't believe 1/3 is value or, more likely, have don't enough gold bullion bars to cash in at those odds)? We begin with some history-pokery and a sniff around any profile angles that might be lurking, using the past 19 renewals, covering 20 years (abandoned in 2001). This is one of those stats around which one needs to be very careful. You may read that horses aged eight and up have had the best of it but, whilst in the simplest sense that may be true, the young bucks have actually held sway. So, yes, 13 of the 19 (68%) Champion Chase winners since 1997 were aged eight or older. But they accounted for 81% of the runners, and only 75% of the places. In other words, they were doing a bit less than might numerically have been expected. Compare that with the five- to seven-year-olds. This age group won six Champion Chases (32%) in the last two decades, from just 19% of the runners. And they took out a quarter of the places, too, from that less-than-a-fifth of those going to post. With no five- or six-year-olds in the entries this season, the seven-year-olds still engaged (though possibly not by tomorrow, Thursday 9th March) are Douvan, Altior, Traffic Fluide, Fox Norton, L'Ami Serge and Alisier d'Irlande. One interesting element of those younger winners is that four of the five winners aged seven or less were French-bred. In fact, eight of the last 19 winners - 42% - originated in France from just 31% of the runners. Irish-bred horses also have a solid record: eight wins - still 42% - from 45% of the runners. Aside from a slight tendency towards the French-bred horses, there is not much else to note. Last day winners have a statistical dominance that is obvious. For the record, all bar five Champion Chase winners in the last twenty years won their prior start. That's 74% of the winners (and 51% of the placers) from 36% of the runners. Those finishing second, third or fourth have made the frame in direct proportion to their runner numbers, but what is of mild interest is that of the eight horses to line up having fallen or unseated last time, two won and another two made the frame. Indeed, while three of them fell again, the full form string for last day tumblers is 1F3F14F2, a sequence that includes 5/1 and 9/1 winners; placed efforts at 16/1 and 14/1; and a fourth placed 33/1 shot. Horses that are most effective in two mile chases almost necessarily take risks at their fences. So perhaps we should be more forgiving, especially when the market seems to have a blind spot in relation to such runners. The sample size is small and, in any case, the chances of beating Douvan are slim, but perhaps we might have a second glance at 2014 winner, Sire De Grugy, in spite of his advancing years. Then again, perhaps not. Horses returning after a break of between one and two months have easily the best record. They've claimed 84% of the wins, and 75% of the places, from 59% of the runners. Those returning within a month have made the frame less than half as often as might have been numerically expected; while those absent for two months or more have marginally under-performed. It's hardly a knockout blow for any horse's chance but the right combination of fresh and fit looks advantageous, and counts against Sire De Grugy, God's Own and Alisier d'Irlande. What to 'dou' with Douvan? He has a commanding edge over this field in the presumed absence of Altior and Un De Sceaux, and is unbeaten in his last fourteen starts since a debut second back three years ago. He's nine from nine over fences, including six Grade 1's, and he seems unfussed by the state of the turf. Douvan's dominance is somewhat accentuated by what looks a pretty shallow division this term, with Fox Norton a tenuous 'best of the rest'. Formerly with Nick Williams and Neil Mulholland, Colin Tizzard's second season chaser has seemed a trifle overblown to my eye: victories over the likes of Dormello Mo and 140-rated sorts in a handicap chase are not the stuff of Champion Chase second favouritism. And I can't help but feel his official rating is inflated, a comprehensive doing by Altior (received five pounds, could have given a stone) last time doing nothing to dispel the notion. I simply don't believe that Fox Norton is worth a rating of 166. God's Own is famously a 'spring horse', winning at the Punchestown Festival in the past two seasons, and doubling up last term with a victory at Aintree (at odds of 10/1 and 9/1, no less). He was eight lengths behind the resurgent Sprinter Sacre in the 2016 Champion Chase, a distance which was only good enough for fourth. Tom George's nine-year-old ought to again get close to the frame if taking in this rather than the Ryanair, and I prefer his 'been there, done it' CV - in spite of a preference for two and a half miles - to Fox Norton's flattered (in my view) formbook page. Could Vroum Vroum Mag show up here? She might, but her form at two miles in the mares' division is not good enough to entertain seriously in a Champion Chase. Uxizandre is considered more likely for the Ryanair, a race he won two seasons ago before injury kept him off the track until last month. There he picked up the pieces behind Un De Sceaux, form that looks good enough to make the Champion Chase frame in a very weak year. He loves Cheltenham and is 11/2 non-runner no bet, without Douvan. And what of Special Tiara? He's run terrific races to be third in the last two Champion Chases, both times of layoffs since Christmas, whereas this time he ran a shocker in late January here in the re-routed Clarence House Chase. He's 6/1 in the 'without Douvan' market which makes more appeal than plenty of his rivals, without compelling this scribe to reach for his wallet. The 2014 Champion Chaser, Sire De Grugy, has had a quietly pleasing season in many respects. Ignoring an early fall on his most recent outing, he'd previously won a valuable handicap off a mark of 160 carrying top weight before running a length second to Un De Sceaux in the Tingle Creek. It seems, however, that connections will rough him off for the season now, missing all of the spring festivals. Down, down the lists we go, in search of a faintly interesting alternative to Douvan. The truth is there are none, but I want to play the 'without' market so the quest continues. Garde La Victoire has ability but can't jump and is probably seven pounds south of what is needed to hit the board, while The Game Changer has lost all of his last ten races. L'Ami Serge has been hurdling so must be doubtful here and, in any case, he was nearly lapped by Camping Ground last time. His best chasing form is not up to the job. Help. Where have all the credible contenders gone? Alisier d'Irlande beat a weak Grade 3 field last time on heavy ground, having failed to pass a rival in his two previous races; and Simply Ned hasn't won since October 2015 when taking a Class 2 handicap at Kelso. Tom George has a second potential string to his bow in Sir Valentino. Beaten far enough in a handicap hurdle on his only Cheltenham visit, he has progressed markedly in the last fifteen months, from a rating of 132 to 157. Barring one shocker, when stretching out to 2m6f at Market Rasen in the summer, the eight-year-old has been consistent and - unlike many in the list - has actually won a couple of races. Beaten five lengths in the Tingle Creek, he was the finisher that day and, over a slightly longer trip on a stiffer track, he might again finish off his race better than most. I loved Traffic Fluide last season, and thought he was a real player for Champion Chase honours on the back of a big run in the 2016 Clarence House. But he got injured before Cheltenham, and was not seen again until two last placed finishes a week apart in mid-February. He's impossible to fancy off the back of that preparation. Phew, what a motley crew. ...will be added after the five day declaration stage. This is 'bar a fall' territory for DOUVAN. He's a winning machine pitted against serial losers. It's hardly fair and, in truth, it won't be a matter of watching a superstar imperiously stroll to victory but, rather, a Grade 1 star trampling all over a field of handicappers. I'm not in the habit of tipping, or backing, 1/3 shots but I love the 'without' markets. With non-runner no bet on my side, I definitely want a bit of Uxizandre each way at 11/2. And, much more speculatively, I think Sir Valentino is another who could get rolling late in the play to grab some place money. 8/1 with the same NRNB concession seems fair enough. All the more so if Uxi goes to the Ryanair. Un De Sceaux did his best to throw it away, yet still had enough in the locker to battle back to a thrilling success in the Tingle Creek Chase at Sandown. This was a case of the quicker horse winning, rather than the most fluent jumper succeeding. Mullins’ chaser is a classy sort, but he’s not one for standing off a fence and launching himself in an extravagant manner. 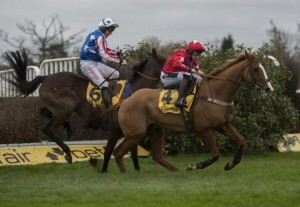 He got in close at the last two fences, and each time appeared to hand the initiative to Sire De Grugy. But Walsh’s mount is quick over the ground, and had enough time from the last to the line to get his head back in front. The race developed as many had anticipated, with Ar Mad setting a strong gallop from the front. All looked well for the returning youngster, until a serious error at the first of the railway fences almost brought him to his knees. The loss of momentum took him from first to third, and he suddenly looked a little sluggish. As the front two went head to head from the last, it was notable just how well Ar Mad finished off the race. Ring-rust put paid to his chances this time, but he remains a potential star. The future looks bright for Ar Mad, though possibly at trips beyond the minimum trip. Un De Sceaux once again proved himself a solid performer, though is undoubtedly vulnerable to a bolder jumping two-miler. The Tingle Creek probably confirmed that the division is at the mercy of Mullins’ latest star chaser, Douvan. Need a talented two-mile chaser - who you gonna call? No not the GHOSTBUSTERS, but rather the REPUTATIONBUSTERS! The ‘go-to’ trainer in the two-mile chase division was at it again on Saturday, when the Gary Moore trained Violet Dancer romped to victory in the Kingmaker Novices’ Chase at Warwick. The three runner event was billed as a suitable prep for the Nicky Henderson trained L’Ami Serge. Sent off the 1/5 favourite, he was expected to cruise to victory, further enhancing his Arkle Chase credentials. However, Mr Moore had other ideas, and again captured a valuable Saturday prize. Violet Dancer joins a powerful looking team at Cisswood Stables, with Sire De Grugy, Traffic Fluide and Ar Mad already exhibiting their talents on the track during the winter. The six-year-old has a similar running style to the yard’s star novice, and between them they have now downed both of Henderson’s leading two-mile novice chasers, with Ar Mad having beaten Vaniteux at Christmas. Violet Dancer attacks from the front, forcing errors from those trying to land a blow. At Warwick neither L’Ami Serge nor Fox Norton were able to get close, with the contest all but over turning for home. Just as exuberant though less flamboyant at his fences than Ar Mad, this fella is quick to put himself right at his obstacles and spends very little time in the air. He has the look of a flat track bully, likely to be at his very best on tight turning tracks. Henderson felt that his horse had failed to produce his best, but in truth he was hurried out of his comfort zone, and never looked to have the gears to reel in the winner. Last year’s Supreme Novices’ Hurdle exposed L’Ami Serge’s inability to cope with a relentless gallop. He remains a talented horse, but he’ll need to be stepped up in trip if he is to have any chance of winning at the Cheltenham Festival. 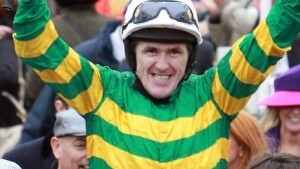 The Moore’s have Ar Mad going left-handed at Plumpton today, with a ticket to Cheltenham resting on his performance. For me it’s the wrong track to test him on. The tightness will exaggerate any tendency to jump out to his right, whereas a track like Cheltenham would be more forgiving. Nevertheless, let’s hope he passes the test and takes his position on the Arkle starting line. The race would be the poorer without him. Whatever the outcome, Team Moore continue to thrive, and have the ammunition to take on all-comers in two-mile chases over the coming years. The last three winners of the Clarence House Chase at Ascot have all gone on to take the Champion Chase at Cheltenham in the same year. The event was first run as a handicap in 1989 when known as the Victor Chandler, and was won by the exceptional Desert Orchid. The race moved from handicap to a conditions race in 2007 and was awarded Grade 1 status. In its short yet illustrious history it has regularly attracted the best two mile chasers, and one of the most thrilling renewals came when still a handicap back in 2004. The Arkle Chase winner Azertyuiop had to give an enormous 19lbs to Nicky Henderson’s talented chaser Isio. In a pulsating finish, the two battled head to head from the second-last fence with Henderson’s eight-year-old a neck to the good at the line. Nicholls’ classy chaser went one better at Cheltenham less than two months later when taking the Champion Chase. The race has certainly favoured young improving chasers, with the last eight victories going to those aged eight and under. It’s no surprise then that the event has often gone to those who have performed well in the Arkle as a novice. Somersby came second in the Arkle Chase of 2010 and filled the same spot in this Ascot feature behind Master Minded in 2011. He went one better when winning the Clarence House in 2012 as an eight-year-old. Master Minded was winning the race for the second time in 2011 having already been successful at the age of six in 2009. The exceptional two mile chaser had already won a Champion Chase by then. Another outstanding Arkle winner took the race in 2013. Sprinter Sacre romped to victory in the Clarence House, a renewal re-routed to Cheltenham, before going on to victory in the Champion Chase. And in 2014 a fast improving Sire De Grugy took the race in testing conditions before backing up that win in the big one at Cheltenham. Last year it was another rapidly improving young chaser that took the event at Ascot. Though Dodging Bullets had only managed fourth in the Arkle Chase as a novice, he had shown vast improvement to take the Tingle Creek, before winning this on route to victory in the Champion Chase at Cheltenham. That brief synopsis highlights the exceptional record of improving young chasers in Saturday’s Clarence House Chase. Often Arkle winners, the race regularly goes to progressive unexposed chasers. When looking at Saturday’s renewal, it’s impossible to ignore the one outstanding candidate for the race and understandably the short-priced favourite. Un De Sceaux, assuming he takes up the entry, arrives as last season’s Arkle winner and is yet to be defeated in any race under rules when successfully reaching the finishing line with a jockey still on-board. There’s plenty out there that are crabbing his form and point to his jumping frailties, again evident when hitting the deck last time at Leopardstown. Nevertheless, he is the outstanding racehorse in the field; is relatively unexposed over fences; and an improving eight-year-old with that all-important Arkle victory on his CV. 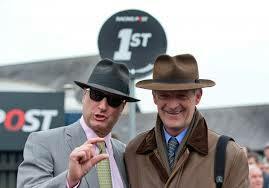 Of course all the above does not guarantee victory for the all-conquering Willie Mullins. 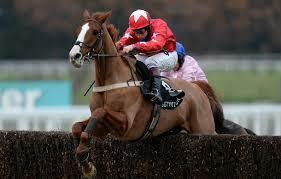 In opposition is a former winner of the race and the Champion Chaser of 2014; Gary Moore’s Sire De Grugy. He looks to be back to something near his best, indeed his trainer believes the 10-year-old is working as good as ever. One trend in his favour is the record of Tingle Creek winners who follow up with success in this. Six of the last seven that took the Sandown feature came here and won. The only one that didn’t was Sizing Europe, when he swerved Ascot in 2012. Vibrato Valtat is also worth a mention. He is also an improving young chaser, though the limitations of his ability have been exposed in his last two races when third in both the Tingle Creek and the Desert Orchid. Should the top two fluff their lines, he is best placed to prosper. In reality it has the look of a straight forward duel between the top two in the market. If Ruby can steer Un De Sceaux round without mishap, he’ll surely take some catching. However, in Sire De Grugy we have a top-class chaser more than capable of taking full advantage given the opportunity. It should prove a thriller. The year had started with England retaining the Ashes down under. On the Flat, Frankel had stormed to victory in the Sussex Stakes at Glorious Goodwood. A young boxer named Anthony Joshua had announced himself as a kid with a bright future when winning a silver medal in the World Amateur Championships. And Novak Djokovic lifted the US Open crown at Flushing Meadows. Some things never change. It had been a hell of a year in sport when the winter of 2011 arrived. And during the King George meeting at Kempton unparalleled success went the way of one of the major forces in Jump racing. Nicky Henderson had a stack of quality horses at his disposal, and the master of Seven Barrows gobbled up a host of major prizes. The Christmas Hurdle has often proved to be a thriller, and this one was no exception. 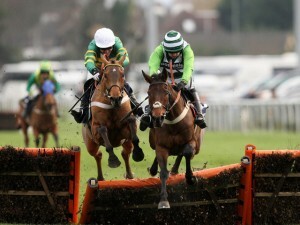 The Champion hurdler of 2010, Binocular, managed to see off the future Champion Rock On Ruby in rip-roaring finish. The ever gutsy Overturn had set off like a scolded cat, and turning for home had the two leading protagonists attacking on either flank. With AP driving for all his worth on Henderson’s champ, and Ruby Walsh aboard the future King, the pair approached the last locked in battle. In a pulsating finish it was Binocular that found a little more to claim victory. Just half an hour earlier Bobs Worth had found both Grands Crus and Silviniaco Conti a little too nifty for him in the Feltham Novices’ Chase. The winner failed to build on the stunning success, whilst Silviniaco fell in love with the course. Bobs Worth was to find Cheltenham more to his liking when a few months later he took the RSA Chase. A year on and he was to have his finest hour, when successful in the Cheltenham Gold Cup. Henderson had a double on the day with novice hurdler Tetlami adding to the Binocular win. One that just got away was the King George itself, when the reigning Gold Cup winner Long Run failed to change the course of history. Kauto Star’s date with destiny and an incredible fifth success in the race prevented Long Run from making it back to back victories. One of the all-time greats was in the twilight of his career, yet just 24 hours later a new superstar would announce his arrival. The following day Henderson was not to be denied when a stunning treble included wins for Finian’s Rainbow and rather fittingly the mighty Sprinter Sacre. The former took a cracking Desert Orchid Chase, getting the better of Wishfull Thinking in the shadow of the post. In March he was to win a dramatic Champion Chase at The Festival. For Sprinter Sacre, things were just a little more straightforward. Only three went to post in the Wayward Lad Novices’ Chase, with Peddlers Cross the odds on favourite. However, the former Champion Hurdle runner-up failed to land a blow, with Henderson’s gorgeous chaser simply scintillating. Occasionally looks are not deceiving. Sprinter Sacre had all the physical attributes necessary to become one of the great chasers. And so it proved. The Seven Barrows handler has a terrific record with his young chasers in the Wayward Lad at Christmas. He’s turned out seven winners since 2000, including Simonsig in 2012. He relies on Vaniteux this time round, the horse having already won at the track on his chasing debut. He was mightily impressive that day, and many, me included, will be hoping to see another exciting performance on Sunday. It could prove a thrilling day for Henderson, with Sprinter Sacre set to run in the Desert Orchid just half an hour later. 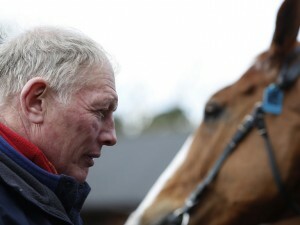 The nine-year-old may well clash with Gary Moore’s former Champion Sire De Grugy. The former looked something like his old self when sauntering to victory in the Schloer Chase at Cheltenham, whilst Moore’s fella brought the house down with his success in the Tingle Creek. 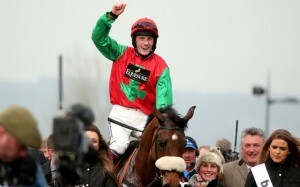 Kempton 2011 proved momentous for Henderson and his team. But he’ll be more than ‘ho ho hopeful’ that this Christmas can deliver a Santa sack full of success. Gary Moore’s current purple patch is testament to the highs and lows of our great sport. Since sustaining a painful injury at his Sussex stables which saw him hospitalized for several days, the fortunes of the yard have turned dramatically, culminating in yet another treble at Sandown on Saturday, including victory in the Grade 1 Tingle Creek for stable star Sire De Grugy. Travelling with far greater verve than when last seen at Exeter, and spring-heeled at his fences, the nine-year-old was sent to the lead at the Railway Fences and looked to have the race in safe keeping turning for home. However, Special Tiara renewed his challenge and at the final fence the two collided mid-air before Sire De Grugy pulled out more towards the finish. That final fence drama should not detract from a wonderful performance from Moore’s fella. The ex-champion is certainly back to something like his best, though down the line may well find a certain Un De Sceaux plying his trade at a different level. Back in third on Saturday was Vibrato Valtat. At a track he clearly enjoys, and with conditions appearing to be in his favour, he just came up short. Outpaced by Sire De Grugy he briefly closed turning in, but was then put in his place by the front two. At the age of six there is time for further improvement, but it’s likely he’s simply not quite good enough in this type of company. Earlier on the card Moore had saddled the winner of the Grade 1 Henry VIII Novices’ Chase, when Ar Mad caused something of an upset with an outstanding front running display. Wonderfully slick over his obstacles, he set strong fractions before staying on well to run out a 10 length winner. He has to go right handed, and his trainer was quick to dismiss the Cheltenham Festival as an end of season target. A pair of Grade 1 victories and trebles on consecutive days at the Esher track was a truly exceptional performance from the Sussex handler and his team. Few would grudge one of racing’s most likeable families every bit of their well-earned success. For trainer Gary Moore it’s been one hell of a week, but thankfully it ended on something of an upward curve. Released from hospital after the kicking he received from one of his horses, his spirits would have been further lifted by an outstanding treble at Sandown. Ar Mad caused an upset in the beginners chase, defeating his more fancied rivals Golden Doyen and Sirabad. It was a fine front-running performance, though the race was most memorable for the erratic jumping from the runner-up and even more so from Paul Nicholls’ charge who persisted in taking off a mile from his fences. The Tingle Creek is still on the agenda, though a run over hurdles beforehand is a real possibility, and may be just what the old warrior needs to restore his confidence. The team can also look forward to an exciting campaign with novice chaser Violet Dancer. A little erratic at times on his debut outing at Towcester, he nevertheless won with plenty in hand, and with more experience and allowed to bowl along in front, he is sure to win his fair share of races. His front running demolition job in the Betfair Hurdle at Newbury back in February will live long in the memory. Baron Alco is another with the potential to reach greater heights. A little too keen at times, he has to learn to settle better in his races. However, a truly gutsy win at Stratford last time over hurdles gave cause for optimism, and he’ll surely make a better chaser; he’s certainly bred to be. Pleasure and pain often ride side by side in the sport of horse racing. With a current strike rate of around 20%, Gary Moore will be hoping for continued pleasure on the track, and far less pain off it. 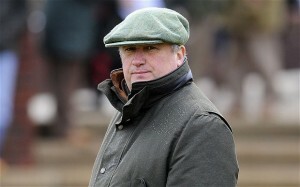 Rarely does a Saturday go by without Paul Nicholls hitting the target. He’s had an incredible winter which has seen him pull miles clear in the trainer’s championship.